The Certificate of Analysis (CofA) is perhaps the most important document for a compounding pharmacy. Compounders must have a high level of confidence in the identity and quality of the ingredients they select. The CofA provides pharmacists with the quantitative data necessary for proper formulation and quality of compounded pharmaceutical products. At Letco, we test every receipt of bulk chemical product when it is received in our Decatur, Alabama distribution center and before any sale of the product may occur. Our unwavering commitment to quality ensures customers can rest easy, knowing they will only receive the highest quality product available when purchasing from Letco, as reflected by our unmatched quality record with the FDA. 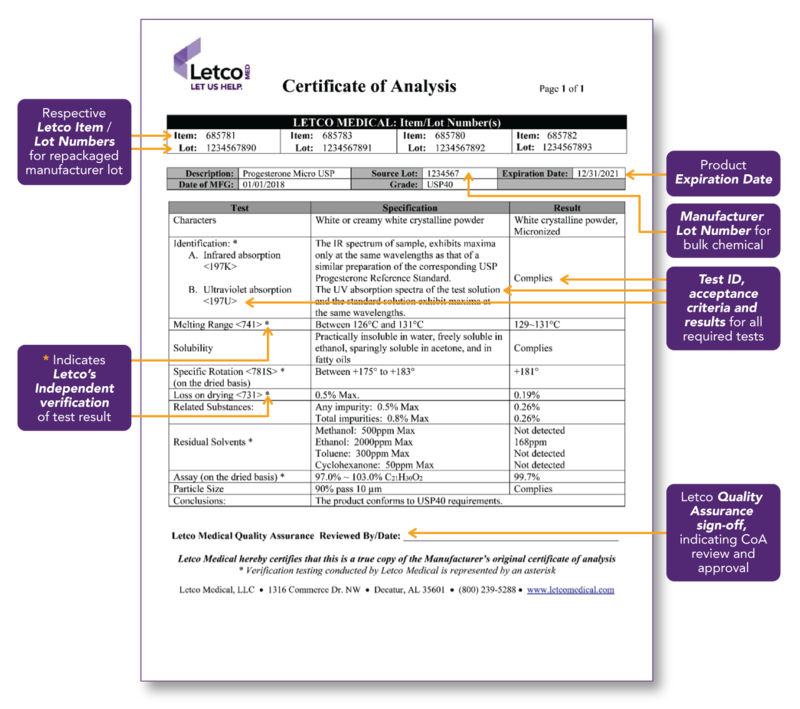 The Letco Medical Certificate of Analysis (CofA) is a true and correct replica of the original CofA provided by the manufacturer. The manufacturer CofA is reviewed for accuracy and compliance with its respective monograph. A full CofA verification program that includes API testing is conducted by an independent, third-party FDA-registered US laboratory (reflected by an asterisk (*) on Letco’s CofA). At least one identification test is conducted on every bulk chemical receipt (unlike other suppliers who only test one per lot), with confirmatory testing noted by an asterisk (*) on Letco’s CofA. This process is just one of the many ways we show our commitment to providing our pharmacy partners with only the highest quality products available. To access CofA forms from Letco’s website, you can use our search bar above, or when logged into your account, retrieve the invoice for the product purchased in your Order History.